Some 40,000 people took part in the protests in Belgrade, Nis, Novi Sad, and several smaller cities, organizers said on Saturday. The authorities did not immediately provide their count. In Belgrade, protesters carried a banner showing a bloodied shirt, an allusion to the unsolved assault on leftist leader Borko Stefanovic in November. An umbrella of opposition parties, the Alliance for Serbia, suspect President Aleksandar Vucic's Serbian Progressive Party (SNS) of involvement in the assault. The ruling party rejects the claims. Demonstrators called for protecting media freedoms, ending the country's hostile environment for journalists and opposition figures, and transparency from the government as it seeks to settle outstanding disputes with neighboring Kosovo. Many demonstrators called for protecting media freedoms, ending the country's hostile environment for journalists and opposition figures, and transparency from the government as it seeks to settle outstanding disputes with neighboring Kosovo. Actor Branislav Trifunovic told the Belgrade rally that Serbia was "the country for us and not for thieves" and urged the public to also protest next Wednesday, the anniversary of the 2018 murder of Oliver Ivanovic, a Kosovo Serb politician. Ivanovic, an opponent of Vucic's Kosovo policy, was shot dead in the Serbian enclave of Kosovska Mitrovica in broad daylight. Perpetrators have not been found. Vuvic, a former ultra-nationalist turned advocate of Serbian membership of the European Union, has rejected accusations that has ruled autocratically, first as premier from 2014 and then as president from 2017. But last year, the European Commission cast doubt on media freedoms in Serbia, citing violence and threats against journalists. Protests, which began on December 8, escalated after the president said he would not agree to protester demands, "even if there were five million people in the street." 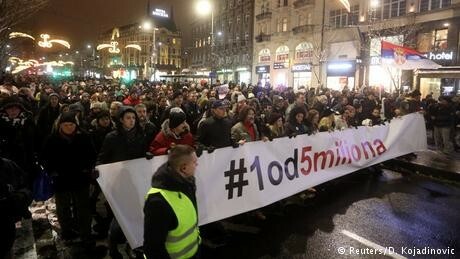 Protesters then adopted the slogan "one in five miliion." Opposition leader Dragan Djilas said the scale of protest had "caught many people by surprise, including some (opposition) politicians." "For the moment, they can walk with us and shut up," said actor Trifunovic, reflecting protesters' general wariness of politicians trying to profit from the disquiet. He reiterated protesters' calls that Serbian public broadcaster RTS end a "media blockade."